Despite the season being nearly over, I still had a number of highly important races left. First up was the final round of the Junior World Series in Basel, Switzerland. With it being my last chance this season to perform highly at international level, I was determined to produce my best result of the year. The course in Basel was unusual as it was very flat and fast which was sure to create very tactical and unpredictable racing. I was hoping to be able to get to the front of the race off the start but unfortunately I hesitated a little too much and missed my chance of moving up putting myself in a difficult situation. Throughout the opening lap a lead group formed which I wasn’t in and due to the nature of the course being in a group was very beneficial. I pushed hard to try to bridge to the front group but I wasn’t able to make it and ended up in no man’s land. I was feeling good so I was able to pick off a few riders but ultimately going into the final lap I was caught by a large group. It was good to be able to win the battle within that group but an overall position of 20th wasn’t what I had hoped for. It was frustrating as I felt like my form was good but a number of tactical errors meant that I was unable to achieve my best result. On the plus side, I am now better informed on how to compete in a race of this type. Also, the city of Basel was a really nice place and I enjoyed exploring the area in the days leading up to the race! After the race in Basel, I had just 5 days until the start of the Junior Tour of Wales so picking up a cold wasn’t ideal. Going into the race I was still recovering from the cold but I was feeling well enough to race and I’m glad I made that decision. I was really happy to be riding as part of a strong Scottish Cycling team so I was looking forward to it. The race consisted of 4 days and 5 stages which kicked off with an 8km uphill time trial. This went better than I expected considering the circumstances and I was pleased not to have lost too much time on GC. The next 3 days included 3 road stages of at least 100km each and also a 35km circuit race on day 3. My legs weren’t feeling too bad, but I wasn’t able to make any time gains and had to settle with following the leaders on the hilly terrain. The final day was the hardest of the race, and possibly the worst I have felt on a bike in my life. Having tried hard to get in the early break but not succeeding, I was struggling to stay in contact even on easy climbs and I spent most of the day suffering in the wheels. I began to feel a little better in the final 30km and was able to make some attacks but I was always followed. Going into the final tough climb up the tumble I simply didn’t have the legs and just had to suffer as much as possible to limit my losses, just managing to hold on to a top 25 position on GC. 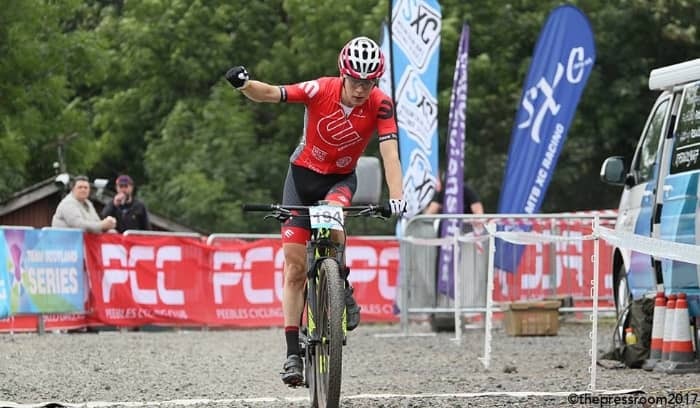 The highlight of the race was definitely seeing team mate Joe Nally take 2 stage wins on day 3 which was really impressive and boosted morale in the team! Despite not being able to achieve the sort of result I would have liked, I couldn’t feel too disappointed as I tried as hard as I could throughout the race and couldn’t have given anything more. It seems as though the season was just a week longer than my body was happy with. Although I wasn’t finished yet. The next weekend was my final race, the Scottish MTB Champs at Glentress. I was excited to race at Glentress as it is rare that we get to do so and I was sure the course would be fun. I felt pretty good in the race and was able to lead from the start. I pushed hard and built up a comfortable lead as the race progressed. After quite a long race I was really happy to be able to take the win and finish the season on a high. Now for some down time to recover from a long and hard season. But it will only be a few days before I am desperate to get back out on the bike and begin my training for the fast approaching cross season! Thanks again to Braveheart for their great support this year.